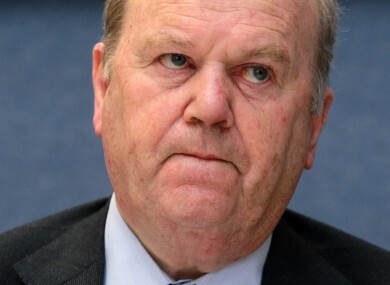 OPPOSITION TDS HAVE hit out at Finance Minister Michael Noonan as he still plans to go ahead with the selling off of AIB shares, despite the Dáil yesterday passing a vote to delay the move. The motion to prevent the sale of 25% of AIB was proposed by Labour yesterday. As campaigns for the Fine Gael leadership got underway, it seems the government forgot all about it. The result of this was the Labour motion to delay the sale passing. However, in a statement yesterday, the Finance Department yesterday said it would not be recognising the vote. As it was on a Private Members Motion, it was “not legally binding” the Department said. In a statement last night, Labour leader Brendan Howlin said Noonan’s decision showed “a worrying contempt for Dáil Éireann”. “If the Government wants to override a decision of parliament, then they should table a new motion, and seek majority support,” said Howlin. Their disregard for the views of parliament amounts to the final nail in the coffin of this do-nothing Dáil. Speaking this morning on RTÉ’s Morning Ireland, Howlin said the move “really underscores the complete impotence of the current Dáil”. His statements were echoed by Social Democrat TD Catherine Murphy. “Instead of respecting the democratic process, Minister Noonan is showing contempt for the Dáil,” she said. He is trying to justify running roughshod over our parliamentary democracy by saying that the Programme for Government allows the sale of AIB shares. Labour said it wanted assurances sought to ensure that the money would be used to pay for new homes, schools and hospitals. In an article over the weekend, Howlin said that the sale would “reduce our debt-GDP ratio by just 1%”. He said that the estimated €3 billion that the government would get from the sale of the shares must be kept in AIB “until such time as we know we can use it”. Email “'Contempt for Dáil Éireann': Government still plans to sell AIB shares despite vote against it”. Feedback on “'Contempt for Dáil Éireann': Government still plans to sell AIB shares despite vote against it”.